Jane Austen turns sleuth in this delightful murder mystery set over the twelve days of a Regency-Era Christmas party. Christmas Eve, 1814: Jane Austen has been invited to spend the holiday with family and friends at The Vyne, the gorgeous ancestral home of the wealthy and politically prominent Chute family. As the year fades and friends begin to gather beneath the mistletoe for the twelve days of Christmas festivities, Jane and her circle are in a celebratory mood: Mansfield Park is selling nicely; Napoleon has been banished to Elba; British forces have seized Washington, DC; and on Christmas Eve, John Quincy Adams signs the Treaty of Ghent, which will end a war nobody in England really wanted. Jane, however, discovers holiday cheer is fleeting. One of the Yuletide revelers dies in a tragic accident, which Jane immediately views with suspicion. If the accident was in fact murder, the killer is one of Jane’s fellow snow-bound guests. With clues scattered amidst cleverly crafted charades, dark secrets coming to light during parlor games, and old friendships returning to haunt the Christmas parties, whom can Jane trust to help her discover the truth and stop the killer from striking again? Francine Mathews was born in Binghamton, New York, the last of six girls. She attended Princeton and Stanford Universities, where she studied history, before going on to work as an intelligence analyst at the CIA. She wrote her first book in 1992 and left the Agency a year later. Since then, she has written twenty-five books, including five novels in the Merry Folger series (Death in the Off-Season, Death in Rough Water, Death in a Mood Indigo, Death in a Cold Hard Light, and Death on Nantucket) as well as the nationally bestselling Being a Jane Austen mystery series, which she writes under the penname Stephanie Barron. She lives and works in Denver, Colorado. "Witty, immaculately researched . . . Reminiscent at moments of Sense and Sensibility." 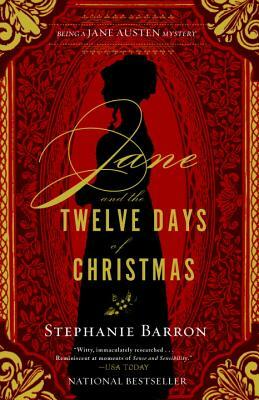 "Jane and the Twelve Days of Christmas is a complex murder mystery with the same kind of rapier wit that Austen deployed. This is great fun for readers who long ago ran out of Jane Austen novels. Barron nails the period. She talks the talk and knows her history. The story stands up as a mystery as well, festooning its surprises in a tinsel of satire." "Just add eggnog and a Yule log." "Ingenious in plot—Barron plays fair with clues in this intriguing whodunit—Jane’s latest adventure offers readers still more: a glimpse of holiday celebrations of two centuries ago, a pleasant excursion into the lives of Britons and a collection of well-drawn characters. Add Barron’s deft imitation of her subject’s prose style, and you have a novel that its subject may well have admired." "[A]n excellent period mystery for all historical fiction fans . . . Jane Austen devotees will especially appreciate immersing themselves in the many biographical details about Austen that accompany the fictional murder mystery." "Vivid characters propel the subtle plot to its surprising conclusion. The first-person narration captures Austen’s tone as revealed in her letters: candid, loving, and occasionally acerbic." "Barron has clearly done her homework in the language and manners of Austen's time . . . Her latest venture edges out competing authors of Regency whodunits." "A good double closed house mystery and an engaging historical novel, with careful descriptions of Georgian Christmas customs." "[M]aintains Jane Austen as intelligent, witty, observant, kind, quick witted, and logical. The historical details of the time are carefully shown via the actions, dialogue, and setting descriptions . . . Just as Jane is putting together the clues and trying to decide who to trust, the readers can follow and come to their own conclusions." "If you have a Jane Austen-would-have-been-my-best-friend complex, look no further . . . [Barron] has painstakingly sifted through the famed author's letters and writings, as well as extensive biographical information, to create a finely detailed portrait of Austen's life—with a dash of fictional murder . . . Some of the most enjoyable, well-written fanfic ever created." "Wonderful . . . echoing the rhythms of the Austen novels with uncanny ease."